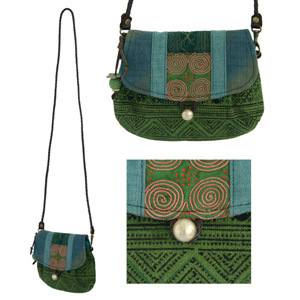 This shoulder bag is designed and hand-crafted by artisan Chirada Loetparisanyu. 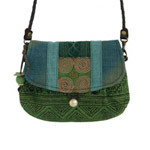 The exterior features a patchwork of green and blue patterns hand-woven and hand-embroidered in cotton by hill tribe artisans. The bag is lined with cotton and closes with a zipper. The flap is secured with a hoop over a ball. The leather braided strap is removable. Materials: Cotton 95% and leather 5%. Aluminum bead.